A report by Adrian Dean, WLMCCC Communications Officer. The Oak Royal Golf & Country Club is a new venue for the West Lancashire Masonic Classic Car Club and what a great find! Located in the stunning countryside of the Ribble Valley, the Oak Royal has magnificent views of the Pendle Hills from its sumptuous restaurant. The afternoon tea proved exceptional in terms of quality, service and value, so I can see us returning at a future date. 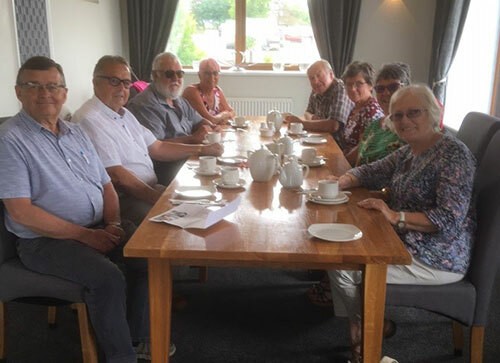 Pictured, clockwise from left, are: Adrian Dean, Mick Norris, Dennis Read, Cath Read, Bill Swindlehurst, Hilda Swindlehurst, Barbara Norris and Elaine Dean. Afternoon tea was introduced in England by Anna, the seventh Duchess of Bedford, in the year 1840. The Duchess would become hungry around four o’clock in the afternoon. The evening meal in her household was served fashionably late at eight o’clock, thus leaving a long period of time between lunch and dinner. This pause for tea became a fashionable social event, so we owe it all to the Duchess. The weather was sunny and warm, which was a cue to lower the soft tops of those of us travelling in cabriolets. Cath and Dennis were the first to arrive in their MGB roadster followed by Bill and Hilda in their brilliant red Jowett Jupiter and Adrian and Elaine in their Mercedes-Benz 300SL-24. The red Jowett attracted much attention in the car park and several onlookers took photographs. The Jowett was a class winner at Le Mans in 1951 and 1952 and this is recorded on a brass plate fixed to the dashboard. Mick and Barbara arrived in their Jaguar XE 2T and promised to drive their 1961 Jaguar MK2 on the ‘Chairman’s Run’ to the Hinds Head, Charnock Richard in October. This venue is close to their home, so there is a high probability that we will see the classic Jaguar. We are all looking forward to the Club’s Classic Car Getaway to the Brown Horse Inn, Winster in September. This 1850’s coaching inn is ideally located to tour the Lake District. 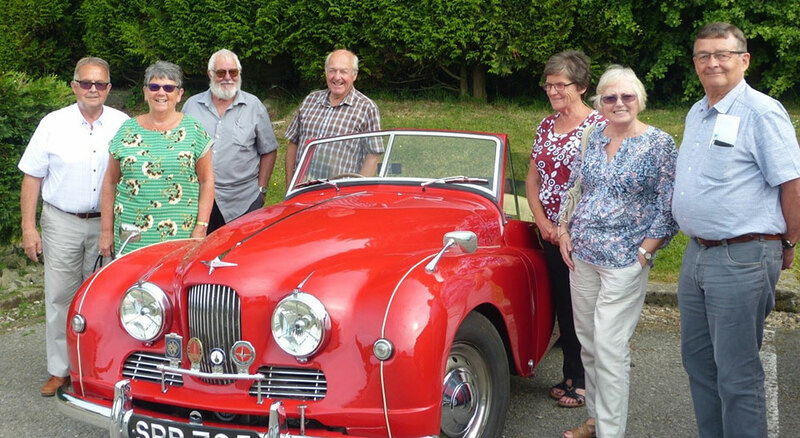 Pictured from left to right, are: Mick Norris, Barbara Norris, Dennis Read, Bill Swindlehurst, Hilda Swindlehurst, Elaine Dean and Adrian Dean, with the Jowett Jupiter taking centre stage.